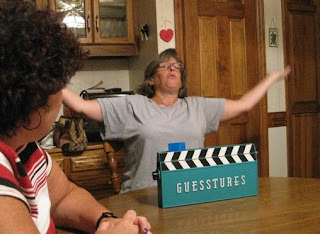 I had the opportunity recently to play my sister, among others, in a hot game of Guesstures. 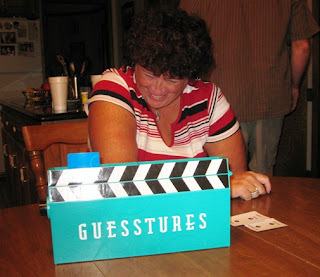 "Guesstures turns up the heat on the tired (Tired??!) game of charades with a few modernizations. 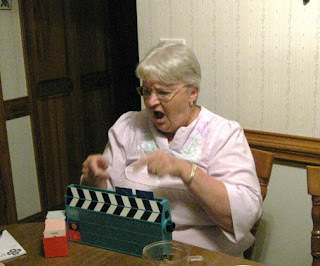 Good, quick pantomiming is still the thing, but now teams need to act out and guess four words in a matter of seconds. Pop four cards into the Mimer-Timer, then set it and start acting fast!....." "The words may look easy, (no, no they don't) but you only have a few seconds to get your team to guess each one. Did your team guess right?..." Now Marji here looks like her word might be armpit. Or teapot. Or angryblackwoman. Quick, can you guess her word? .... you in the back, got it? 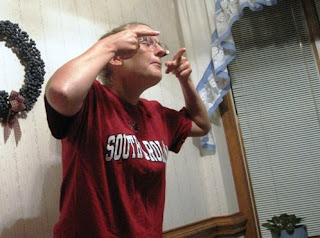 I just look stupid. You can't guess my word! My word was probably nuclear or something. I have one card left standing. Each card has a word and you have four cards per turn. If my animated, extremely interested partners (like Lisa here) can't guess my word in time, the machine will eat my card and I move on to the next. "...When the game's over, will your team have enough points to win the trophy for Best Performance?..." Based on this photo.... ummm.... I'm guessing not. Guesstures is fun, really. The time pressure is a bit much for me, gets my anxiety level up, but otherwise, is a great game. Well, except for the words. I found the words a little odd, a little hard to act out. So. hmmm. Maybe I just liked having fun with family. For 4 or more players, ages 8 and up. Contents: 1 timer, 378 cards, 1 trophy (you know it) and instructions. I received absolutlely nothing in exchange for my review in this blog. I played the game and reported it to you for fun. Nobody is rubbing money in my palms and nobody is pointing a gun at my head. But, hey, think what you want. In that last statement I think you protest too much. PS I can not imagine anyine wanting to play a stupid game like that. I've had people wrecking my house playing this game, slamming out the front door........HOW can you do that and still get your card in time------CAN'T so don't wreck my house! Fun game though and yep people do look stupid. Drifty you sure don't know how to have fun, nosiree! 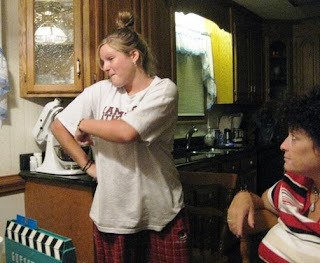 All right everyone calm down, it IS a fun game---after all look at Moms face,doesnt she look like shes ready to play again?